Another something I bought at Germany a bottle of apple kiwi water of Active 02. The most innovative part of this bottle is inside the cap. 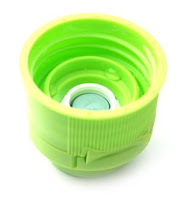 The bottle use a new kind op cap with a valve inside which make the water flow easier to one direction. The easiest is to flow into the bottle then out. Making it less easier to leak compared to the old caps. The print on the bottle is made by printing on a transparent foil which is glued on to the bottle. The foil is printed on two sides. On the inside there is a mountain printed to be a background of the logo on the other side. It uses the colors dark blue, light blue, green, red and silver to print the design. For the taste it is quite good bit like crystal clear but with no bubbles. And not too sweet but good to drink and quite refreshing.